Importantly, Unicef UK recognized that its website was no longer a technical fit for their purposes, having last been refreshed over six years ago. The site contained a multitude of out-of-date content spanning over 4,000 pages. The site was not mobile responsive, as they maintained separate mobile and blog websites, causing a confusing user experience. Working together with Unicef, Manifesto began the process to launch their new website. The Content Management System (CMS) Unicef UK previously used, was clunky and outdated, with an overly-complicated admin process. Many of the content creators were actually “scared” of it, so ensuring the new system was more accessible and intuitive for content creators was the number one priority. Another challenge was that the current website could not keep pace with the traffic demands placed upon it, having failed on several occasions due to spikes in pageviews caused by the public responding to sudden world emergencies. With these factors in mind, Manifesto began exploring different methods to ensure the new site would withstand these kinds of events in the future, without loss of service or speed. Because of their legacy platforms, migration and development obstacles were mostly technical. Asecure transition with minimal disruption is key for both front-facing PR reasons and, of course, fundraising. 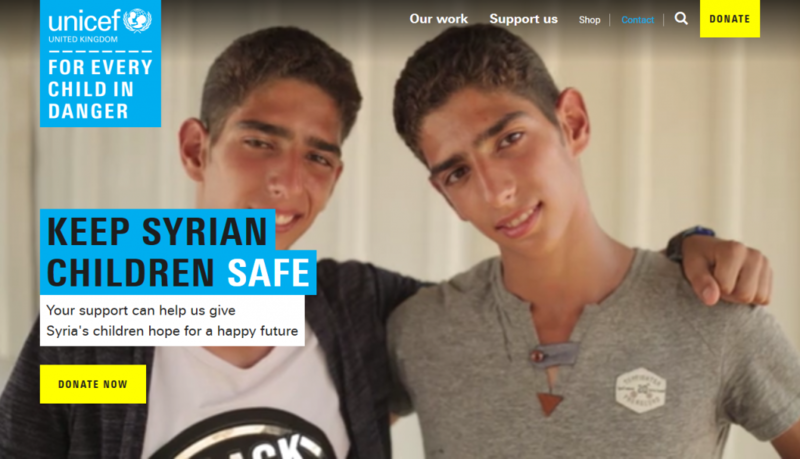 Unicef UK wanted the website integrated with their existing donation platform. It was also important to thoroughly test the new system before launch, since making sure the site held up to spikes in demand was one of the main goals. Why not use WordPress? The editors at Unicef had experience on the platform and enjoyed its easy-to-use interface. Being the most popular CMS means it is very well supported, documented, and highly customizable, which made WordPress the choice in this endeavor. The legacy platform integration was solved by creating a lightweight Restful API layer over the existing platform. This was accomplished with the AWS API Gateway and Lambda. WordPress’ extensibility with custom made plugins make the process of integrating the API straightforward and maintainable in the long term. The new site is easier to use more reliable and now able to handle disaster-related traffic spikes. This freed Unicef to focus on improvements and optimization, while the wider organization could increasingly take ownership of creating, updating, and maintaining day-to-day content. The new site has had a massive impact internally at Unicef, and the organization is really proud of the final product. It has enthused existing users, as well as encouraged some stakeholders who previously weren’t particularly engaged with their online content, to really understand how impactful the site can be. They also actually want to learn more about how they can make use of the new platform, as part of the supporter experience. Since launching in November 2016, conversion rates among website visitors have more than doubled. Cash donations are up 55% per visitor, and, in December, Unicef UK received more online donations in a single month than ever before. In the long-term, Unicef is conservatively estimating a minimum of 50-60% uplift in base-level conversion. Deciding on a new website was a great choice and a step towards protecting more of the world’s children from hunger, disease, and the chaos of war; and in this situation, WordPress was the ideal solution.